Election workers across the country began a marathon review of vote tallies Wednesday to determine whether conservative candidate Felipe Calderon really won Mexico's tight presidential race, while his leftist challenger insisted he was the victor and denounced what he called widespread irregularities. A preliminary count showed Calderon, of President Vicente Fox's National Action Party, ahead by just one percentage point. Charismatic leftist Andres Manuel Lopez Obrador is demanding a recount of every ballot, saying Wednesday: "The political stability of the country hangs in the balance." The ballots that were not counted the first time are now being tallied, reports Bard, but the final will likely be challenged by Lopez Obrador. Federal Electoral Institute President Luis Carlos Ugalde said late Tuesday that 2.6 million votes were not included in the preliminary count because of "inconsistencies," such as poor handwriting or extraneous marks on the tally sheets attached to each ballot box. Lopez Obrador had initially said those ballots were "missing." If a recount of the votes inside prove the numbers on these tally sheets are valid, Calderon would still lead, but by just 0.64 percent — about 250,000 of the 41 million votes cast — Ugalde said. 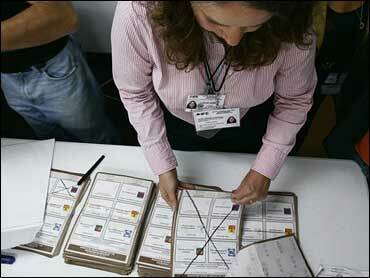 Electoral officials across Mexico began early Wednesday to review all the tally sheets, a process that by law must continue around the clock until the final, official result is determined. It was unclear when that might be. Ugalde said officials will open ballot boxes to conduct individual counts only where there are tally sheet problems. In an initial meeting between electoral officials and party representatives, Horacio Duarte of Lopez Obrador's Democratic Revolution Party demanded that officials recount all the votes "for the health of the republic." "There is one thing missing in this process: certainty," Duarte said. National Action's German Martinez responded: "They want to throw out the election because it didn't favor them. Pressure and blackmail should not prevail." The review that began Wednesday is a crucial step in proving the elections were clean to a nation that emerged six years ago from 71 years of one-party rule replete with election fraud. Failure to convince the public and candidates it has been a fair vote could spark widespread civil unrest. Lopez Obrador aide Claudia Sheinbaum said Wednesday that the party found "very grave inconsistencies" in at least 50,000 polling places, including 18,646 in which votes cast outnumbered registered voters. Federal electoral officials had not had a chance to respond. "Make the review thorough so all will be satisfied, so we can end this process cleanly," Lopez Obrador said. About 35 Lopez Obrador supporters set up camp Wednesday outside the gates of the Federal Electoral Institute, known as the IFE, draping banners that accused electoral officials of being traitors. Mexico became accustomed to widespread accusations of electoral shenanigans during seven decades of rule by the Institutional Revolutionary Party, or PRI. Fears of such fraud have sharply diminished since the IFE was founded in 1990s. The autonomous institute oversaw Fox's peaceful defeat of the PRI in 2000 and has been held up as an example of a world-class electoral body that has advised emerging democracies, including Iraq and Haiti. Interior Secretary Carlos Abascal told reporters Tuesday that the Fox administration "does not endorse the victory of anyone, at all." But political analyst Jose Antonio Crespo said there is still concern that some IFE officials are too close to Calderon and his ruling party. Crespo said the IFE needs to be scrupulous in its review to prove Mexico's democratic credentials. "I am worried," he said. "All the players must tread very carefully or this situation could escalate out of control."